While you might let a bout of diarrhea run its course, you may consider home remedies to help stop the loose, watery stools. There is some evidence that nutmeg may help alleviate diarrhea caused by rotavirus. However, for the most part, spices with heat, such as curry, chili powder or hot pepper, can make your symptoms worse. Consult your doctor to discuss treating diarrhea through your diet or if your diarrhea lasts more than two days. A study published in 2005 in the Journal of Ethnopharmacology investigated the effects of nutmeg on rotavirus, a viral infection that causes diarrhea in children. The researchers found that the nutmeg helped inhibit the growth of the virus in the test-tube study and suggested the spice may serve as a form of treatment for the infection. However, human studies need to be conducted before claims can be made, and nutmeg may not be effective if your diarrhea is due to another cause. 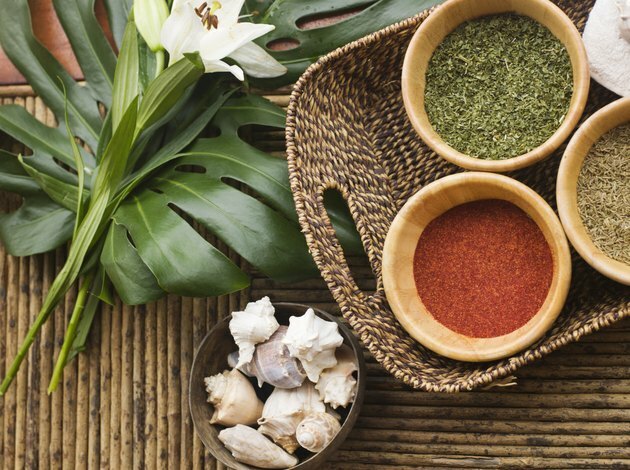 Because spices can cause more harm than good, you might want to consider adding binding foods to your diet instead. The Cleveland Clinic recommends the BRAT diet, which is an acronym that stands for bananas, rice, applesauce and toast. Eat small amounts often, and be sure to drink 8 cups to 10 cups of water a day to stay hydrated.